Setting a nice table doesn't have to mean buying expensive placemats and napkins! You can make your own placemats, napkins and napkin rings for very little money. Using pinking shears, cut up an old pillow case into four equal pieces - approximately 12" x 18". (I found a sheet/pillow case set at a thrift store for a couple of dollars.) 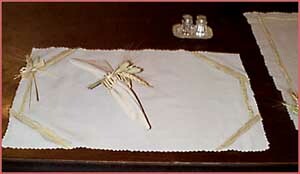 One standard pillow case will make 4 placemats. If you sew, you might want to hem the edges, but I found I liked the raw edges made with the pinking shears. If you're decorating with a theme, decorate your placemats to match the same theme you use with your napkin rings. My napkin rings are wrapped w/ raffia with a wheat/wild grass decoration, so I glued strips of raffia around the edges of each placemat. Experiment with placement and shape, just keep in mind that a plate will have to sit flat on it, so decorate mostly around the edges. 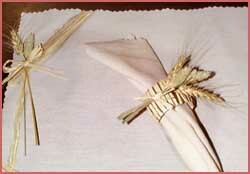 For a final touch, make a sprig using wheat, wild grasses, leaves, etc., and wrap with raffia or ribbon. Glue to the corner of each placemat. If you want something you can wash and save for next year, use fabric paint - dab a little paint on the grasses and press onto the material to make prints, or lightly pound freshly picked fall leaves onto the material. Make matching napkins by cutting up a pillow case or sheet into approximately 10x10 squares. Again, use pinking shears to cut the pieces and leave as is, or hem the edges. Got an old quilt? Don't throw it away. Cut it into pieces and trim the edges with lace, ribbon, etc. Old towels make interesting placemats. You can decorate them using fabric glue and colored felt, or sew on embellishments as you like. Old jackets - especially winter jackets made of thick material make interesting placemats. 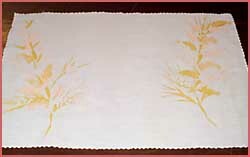 Cut your placemat shapes, then stitch across to hold the material in place (like a quilt). Sew a piece of wide ribbon around the edges for trimming.